The FOMC's decision and dot-plot came in just as the market anticipated. Still, it was quite remarkable to see the shift among Fed members in a matter of only three months. The yield curve keeps on flattening all the way up to 10 years out. Interestingly enough, the long-end is actually steepening. Bonds rally across the board, but investment-grade and long-duration have benefited the most from Mr. Dovish Fed. On the other hand, the greenback weakened, assisting commodities - and crude oil specifically - to gain a lot of ground. 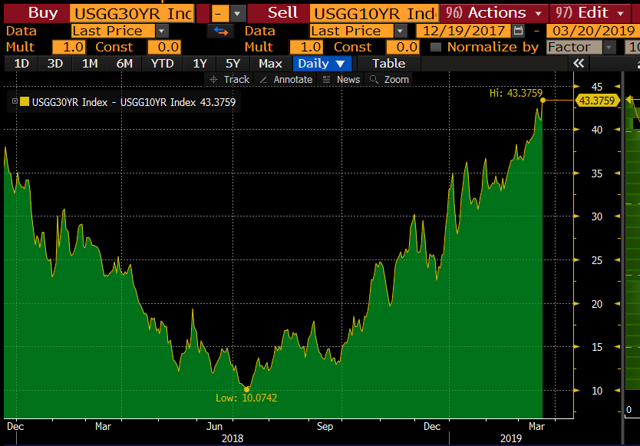 It was only few days ago that we warned you about the partially inverted yield curve. Following the FOMC decision on Wednesday, and the remarks made by Jerome Powell during the press conference that followed it, we now feel that the "partially" is likely to be on its way to "fully". 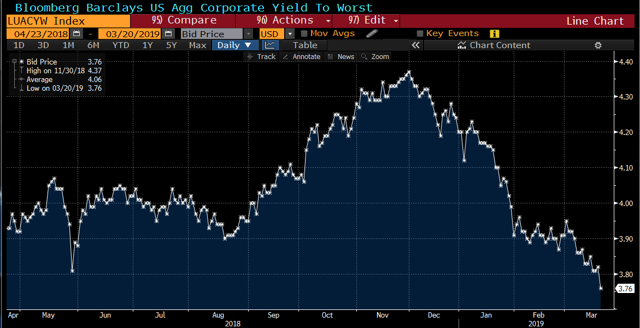 Investors have grown skittish over the possibility of an inverted yield curve, which happens when short-dated bond yields are higher than their long(er)-duration counterparts. 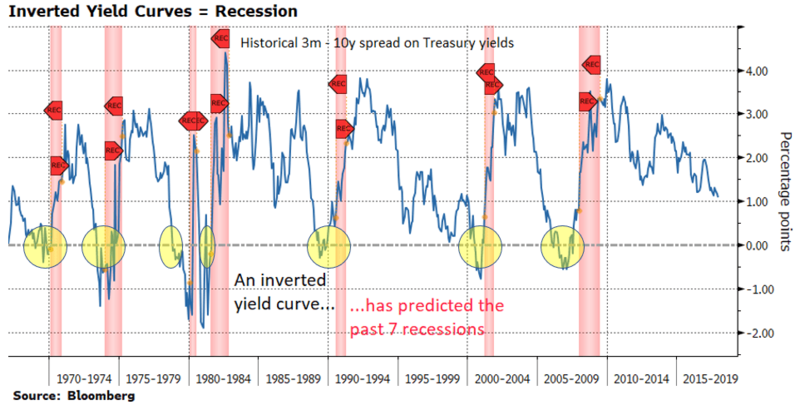 As a reminder, an inverted yield curve - usually measured by the 10-2 Year Spread - has been a very reliable predictor of an upcoming recession. 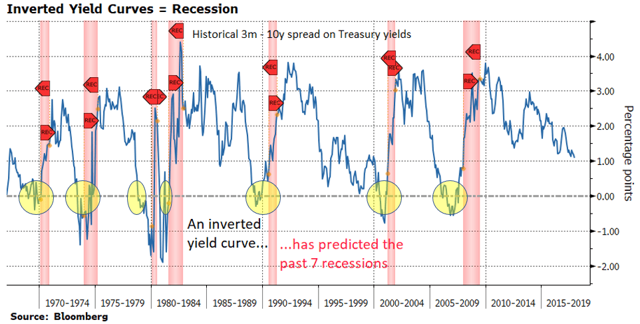 So much so that an inverted yield curve has actually predicted the past seven recessions. You certainly don't want to bet against such a hitting record! Exactly as we expected, the Fed has performed a big dovish shift in its dot-plot projections. 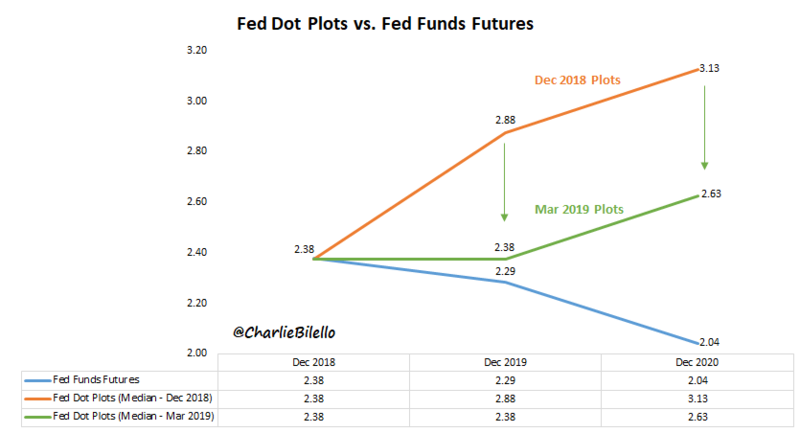 Back in December, the Fed was forecasting four more rate hikes before the end of 2020 (three in 2019, and one in 2020). Now it is forecasting only one more hike before the end of 2020 (0 in 2019, and one in 2020). 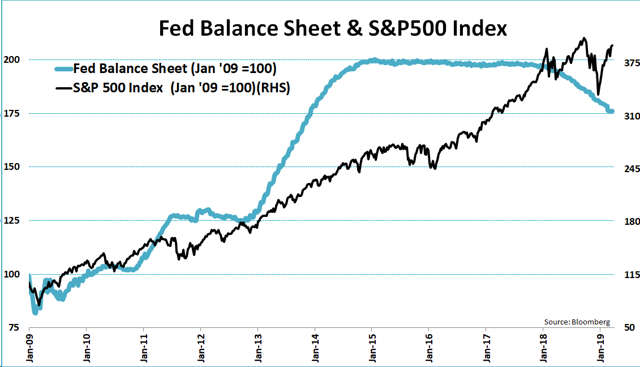 According to current plans, the Fed intends to end its balance sheet unwinding in September of this year. By the way, the market is still more dovish than the Fed (and rightly so), expecting one rate CUT by end of 2020. 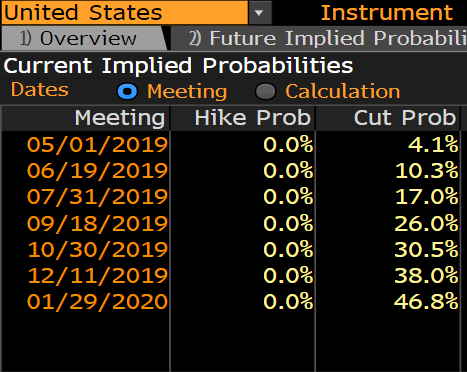 Futures traders are now pricing in a 47% chance of a rate cut by January 2020, up from a 36% chance ahead of yesterday's 2pm FOMC release. What is happening when the Fed is so dovish, and - who knows - perhaps en route for more QE soon? Bonds are rallying obviously. That is true for both Investment-Grade ("IG") (AGG, BND, LQD, BSV, TIP, VCSH, VCIT, SHV, SHY, IEF, TLT) and High-Yield ("HY") (HYG, JNK, BKLN, SJNK, SRLN, SHYG, HYLB, FTSL, HYS, HYLS, BSJJ, EMB, EMLC, PCY, VWOB) alike. Here is the US Treasury 2-Year Yield as soon as the FOMC's decision and dot plot were out. Speaks for itself. German 10-Year bond yields have fallen to the lowest since 2016. At 0.045%, the yield is now a whisker from the zero mark. 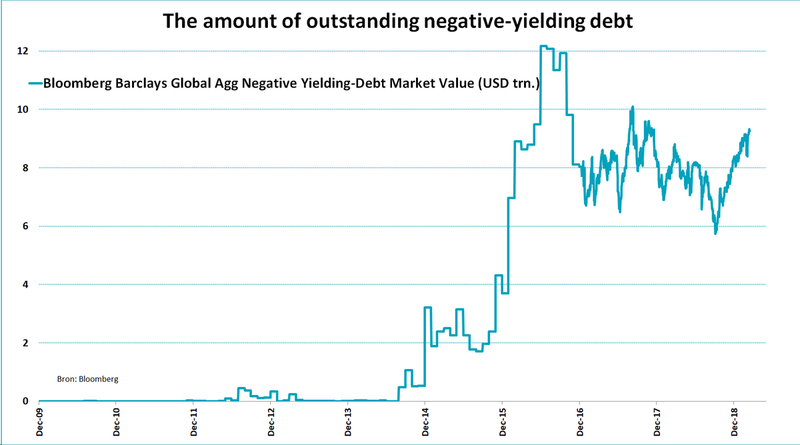 Will it join the over $9.3T of debt worldwide that is already trading with negative yield? It certainly looks like it. 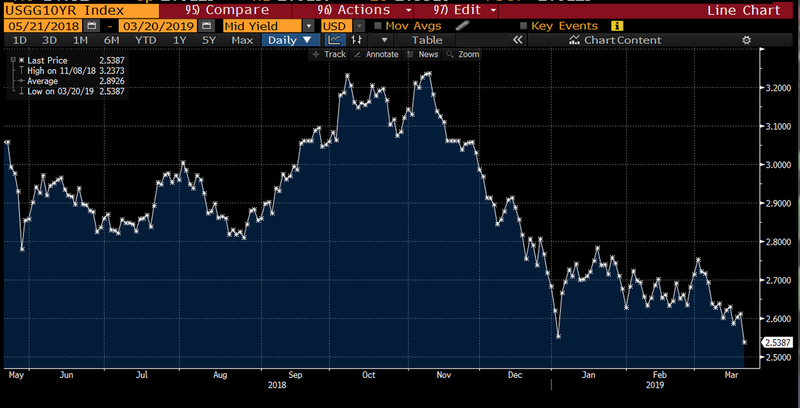 The Fed's very dovish tilt yesterday has given a huge boost to US Investment-Grade bonds. Yields on the debt have fallen to the lowest since April 2018. 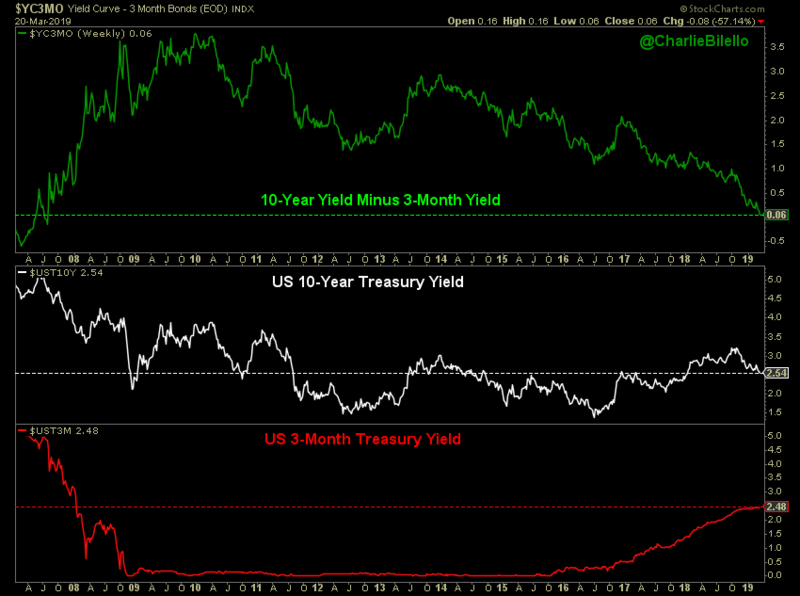 Interestingly this was driven almost entirely by the rally in Treasuries, not a desire to take more corporate risk. 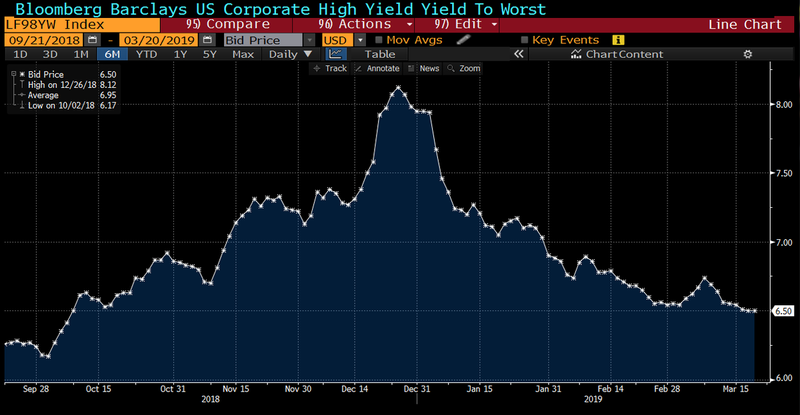 The easiest way to illustrate this is to simply look at yields on junk bonds - they remained unchanged yesterday, staying at the lowest levels since October. Moreover, the iShares J.P. Morgan USD Emerging Markets Bond ETF (EMB) - the largest Emerging Markets ("EM") (EMB, EMLC, PCY, VWOB) Bond ETF, with $17B in AUM - just made a new high yesterday for the first time in about a year. The fund is now up 11% (total return) from its December lows in less than three months. The US Dollar Index (UUP) on the other hand finished the trading day lower for the 9th day in a row. This is tying the longest (downtrend) streak in history (data back to 1973). It's also the first close below the 200-day moving average since May 2018. And when the USD is weak, commodities (DBC) benefit. Crude Oil (USO, OIL) closed above $60 - a four-month high, and up 42% from its December lows. The 1-Month Treasury Yield is now trading at 2.45%, while the 7-Year Treasury Yield is at 2.44%. That's the most inverted US yield curve since 2007! Interestingly and to some extent surprisingly is to see more steepening on the long end of the US yield curve as investors price in more inflation in decades to come, thanks to a dovish Fed. 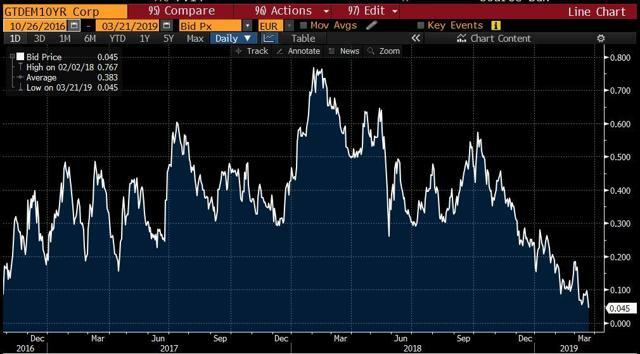 The gap between 30-year and 10-year US yields is now the widest since late 2017! During the 20% S&P 500 (SPY) correction last year, the US 10-Year Yield fell from 3.25% to 2.55% (down 70 bps). The S&P 500 has since rallied 21%, while the 10-Yr yield has fallen 3.3 bp (from 2.55% to 2.517%, as I type). In case, the above chart isn't enough to deliver the message, let me say it loud and clear: The yield curve is telling you that a recession is on its way. First we take Manhattan (that's a fully inverted yield curve), then we take Berlin (a recession)!